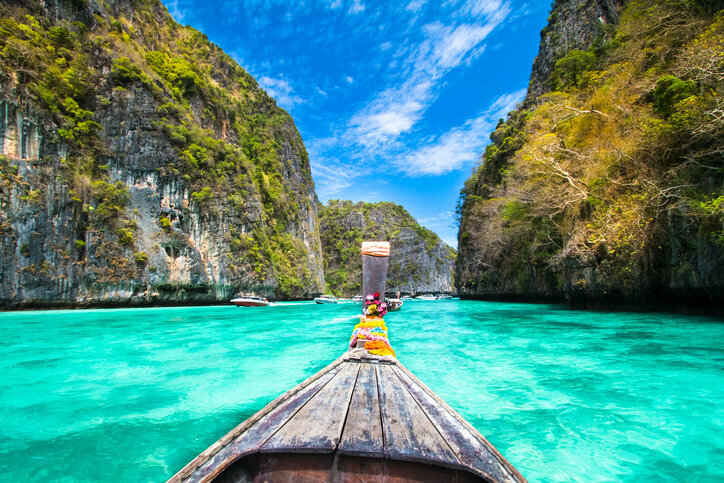 Thailand attracts visitors from all over the world and major travel destination in Asia. 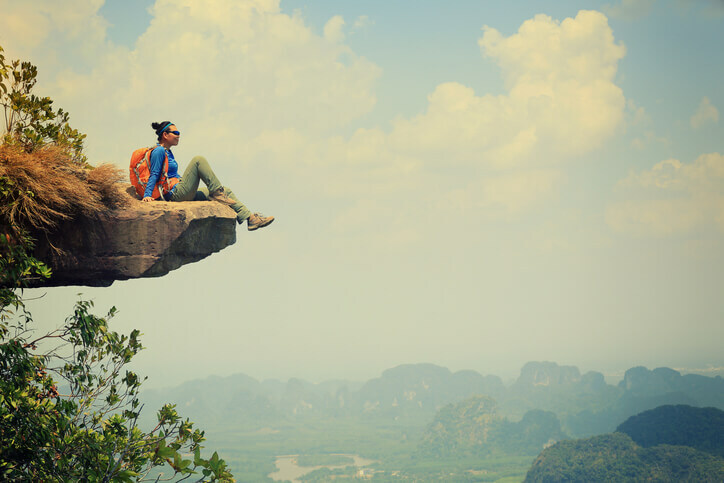 It’s also a great place to backpack if it’s your first backpacking trip due to the ease of getting around the country, cheap accommodation, tourist friendly infrastructure, delicious food, lush green forests, beautiful beaches, diving and snorkelling opportunities and the wildest parties. I myself spent a month backpacking through Thailand and it was one of the best experiences of my life. Except for the ten days that I booked in a Muay Thai gym I had no prior reservations. I booked my return tickets 2 months ahead and got them for 15 thousand rupees and flew Singapore Airlines, which is a pretty good deal. This is the where most backpacking journey begin. Khao San road is the famed backpacker friendly hostel street. This looks like any other Bangkok by lane during the day but by night the street comes alive and turns into a mega street party as bars overflow onto the street and small makeshift bars crop up. Delicious and cheap street food is available to soak up all that alcohol. Nitan hostel is where I stayed; it’s a hip and cosy hostel that offers a free breakfast spread. It has a beautiful turquoise and white theme and I made many friends there whom I met at most of the following destinations. The reception will be happy to help you with your travel plans. Be sure not to lose the key as that’s going to cost you. 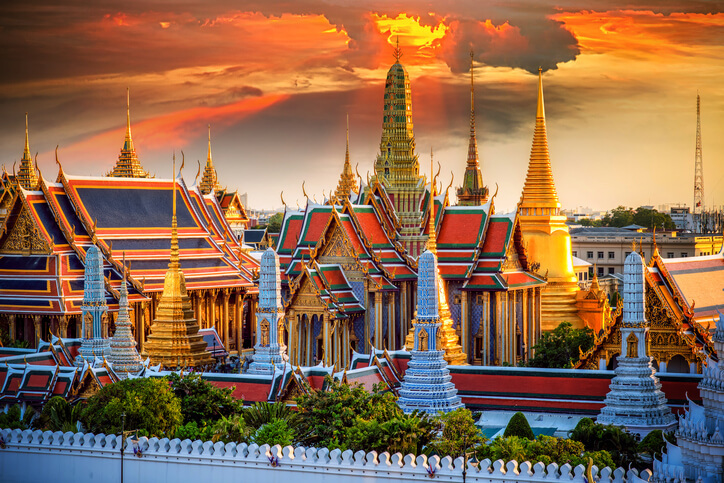 Bangkok has a lot of temples and palaces you can visit, entry is subject to you not wearing any shorts of sleeveless t-shirts and usually an entry free between 200-500 Baht. Be sure to try out one of the many Sky bars. 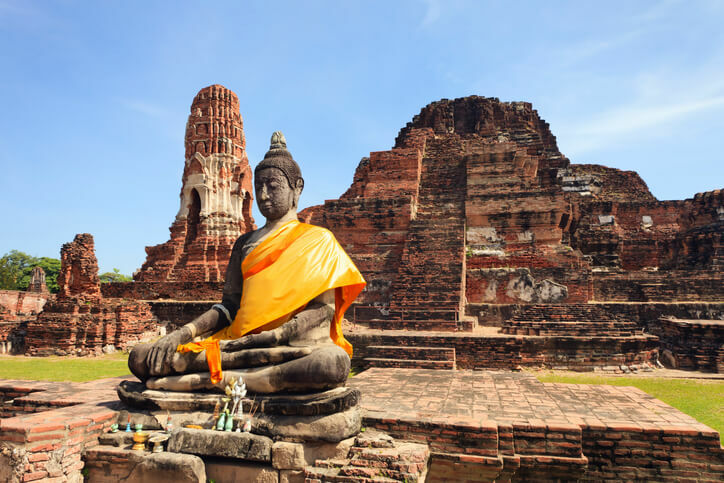 Ayutthaya has a lot of ancient temples one can visit and are similar to the temples you would see at Angkor Wat in Cambodia. The entry fee for most of the temples is between 50-100 Baht. 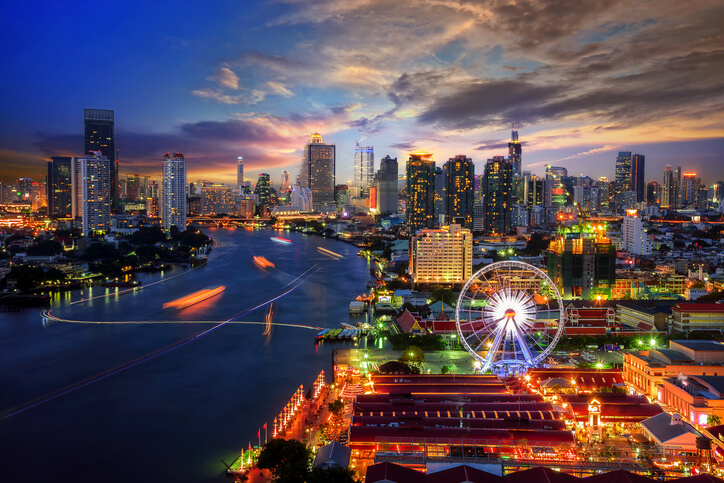 Apart from the temples and museums you must also take a ride on the Chao Phraya river cruise which your hostel can easily organise tickets for you. I did the day trip and it’s a must do! I took an overnight bus to Chiang Mai which available from Bangkok and Ayutthaya as the distance is almost the same, plus you save on a night’s accommodation costs. The bus is really comfortable. I boarded from Bangkok. 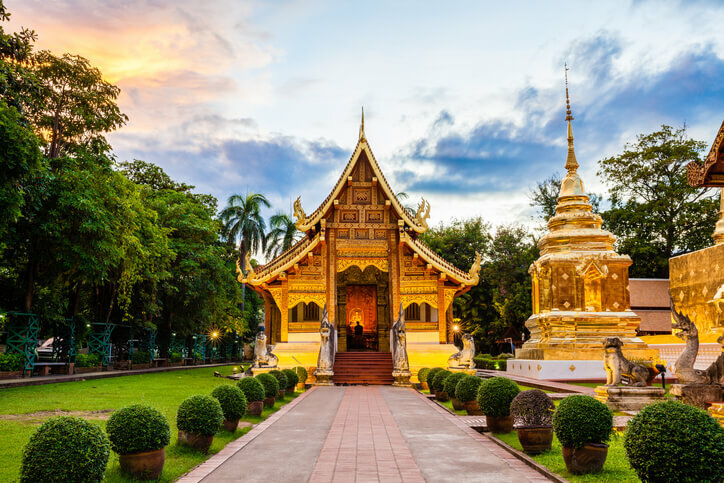 Chiang Mai is in northern Thailand and is at the foothills and as a result has very clean air. I immediately checked into The Team Quest Muay Thai gym, it’s cheaper than most other gyms in Phuket and the cleaner air makes the training worthwhile. It has basic shared accommodation with table fans but it’s perfect as it doesn’t really get too hot and I made some great friends. The gym has great training and equipment and I definitely recommend all Mixed Martials Arts enthusiasts to try it out. Other than that there some great hostels, my friends stayed at like Green Tiger hostel and Big&O’s which are very close to the old city where many of the markets and temples. There are some beautiful temples and secret temples you can ride uphill to and get panoramic views of the city. You must spend half a day at the Chiang Mai Grand Canyon which is man-made but has lots of fun activities. Always hire a scooter to get around as it costs between 150-200 baht per day which is a great way to save money and be independent. Just be sure to get an international driving licence and avoid paying fines. An hour out of Chiang Mai you can visit many elephant sanctuaries. I stayed at Chailai Orchid which has wooden huts, the elephants are rescued and roam free and you are free to feed and play with them also give mud baths which is an amazing experience. The staff has many ladies who have been rescued from traffickers. There is a river that flows besides you and you can hire bamboo rafts. Getting to Pai from Chiang Mai by road is the best option, buses ply every hour from Chiang Mai Arcade bus station and it costs just 160 baht and the journey is around 3 hours and has one of the world’s windiest roads with a harrowing 762 bends! Be sure to take motion sickness pills before you get on that mini bus. It’s possible to hire a scooter and drive there yourself but I wouldn’t recommend it anyone who’s not a good rider as you easily have a life threatening accident. Once at Pai there are many options for hiring bikes, I hired one similar to a Honda Navi and cost me 170 Baht. I checked into “Happy House Hostel” which was great with a great common room area with a pool table and bar which had barbecue night as well. There are many more hostels to choose from with different themes and even amidst paddy fields. 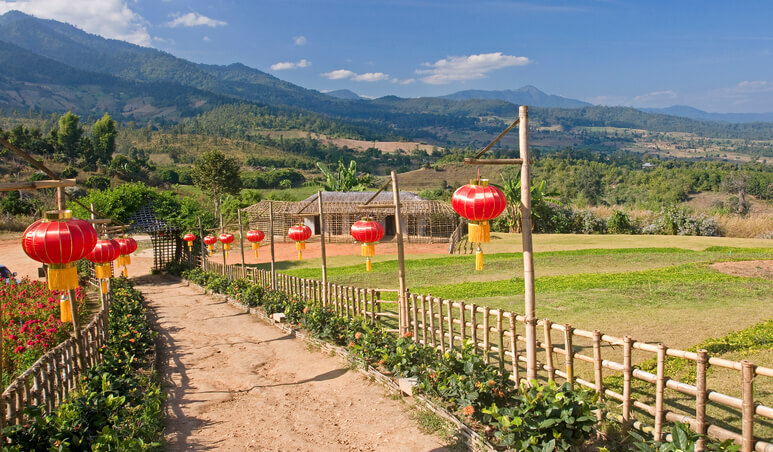 Pai is a hippy hill town and has an extremely chilled atmosphere and life moves at a slow pace. At night there are great jazz bars and parties to wet your beaks at. Land Split (the land had split mane years ago due to an earthquake). “I am Pai” photo point, which is similar to the “I AM Amsterdam”. You must expect breath taking natural views. Pai has many waterfalls and you must spend an entire day checking them all out. Sunset bar, I honestly spent an entire day here, it has a great location between paddy fields and a great bar. I backtracked back to Chiang Mai and took a bus to Bangkok and took another bus that same evening that took me to Surat Thani port that offer ferry services to all the south islands. Koh Samui is a beautiful island on the Gulf of Thailand and has very calm waters making sea swimming very enjoyable. The island has mountainous forest which you can zip line through and get gasping views and also day trip jungle safaris atop monster trucks which was exhilarating to say the least. The 12 meter Buddha is a great day trip as crossing the causeway that leads to that island that houses it is a fun experience. The “Jungle Club” is a great place to spend some of your day light hours. It’s placed atop one of the islands hills and has breath taking views, there’s a wooden deck with bean bags and tables and it’s a perfect way to spend the day with some food and maybe some drinks. I made a dent in my budget and got a bottle of Prosecco and I didn’t regret it one bit! I stayed at P168 which is a Pod hotel which also had individual rooms. It’s extremely futuristic and offers free breakfast which was an added bonus. It’s placed on a Chaweng beach and has a street filled with great food and bars. There were lots of fire eaters and fire acrobatics going on every beach at night which was great fun. Koh Tao is known worldwide for its world class diving and scuba diving opportunities. It’s also the cheapest place in the world to get your diving licence which allows to solo dive anywhere. The white sand beaches are extremely clean and picturesque and the sea is extremely calm. The island is surrounded with beautiful coral reefs that are still very much alive. I stayed at the hillside resort which I booked through Air BNB which offers free pick up from the port and drop too. They have a private beach which was awesome and they rented scuba gear which was an added bonus. I spent a week here as I was taking diving classes. The rooms are all atop stilts and on a hill side and you wake up every morning looking at the sun rising and the clear blue sea. All the bike rentals will take keep your passport with themselves while you keep the bike, I was extremely shocked but I realised that that’s the norm and there was no way around it. I got my passport back safe and sound. I stayed at The Bay resort which I also booked through Air BNB and the resort offers rooms right on its very own private beach, and the cost can be 2200 baht per night. It has a very nice pool as well and a restaurant that opens up onto the beach and is great setting for any meal. It also has a pool table and a lovely bar that serves great cocktails and did I mention happy hour? Yeah they even have happy hour! During the morning the tide recedes and you can walk pretty deep into the sea. The resort also has its own paddle boats which you can take into the sea and soak up the sun set in peace as the water is very calm. 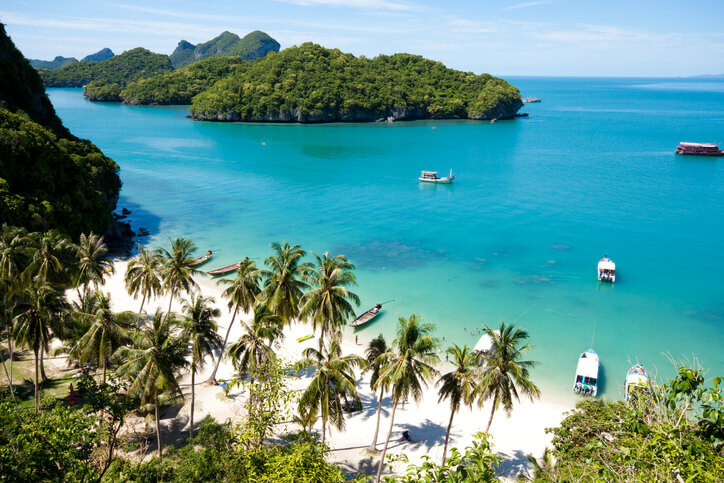 Koh Phangan is commonly known for its full moon party that takes place every month, but don’t worry if you don’t make it in time for that. There is a party every night and they are just as good and known as half-moon parties. I made it for the dark moon party which as the name suggests takes place on a moonless night and it was on the beach with blaring trance music and lots of fire acrobats. Koh Phangan is also surrounded by active coral reefs and you can spend the day snorkelling and being amazed with what you see under water! Every beach rents snorkelling gear and charges by the hour and it’s a great way to see the island and explore its white sand beaches. The best way to get around is by your own hired scooter, be careful you don’t get lost in the alluring views and crash your bike though.